Volcanoes aren't unusual in Indonesia, one of the world's most geologically active countries. Mt. 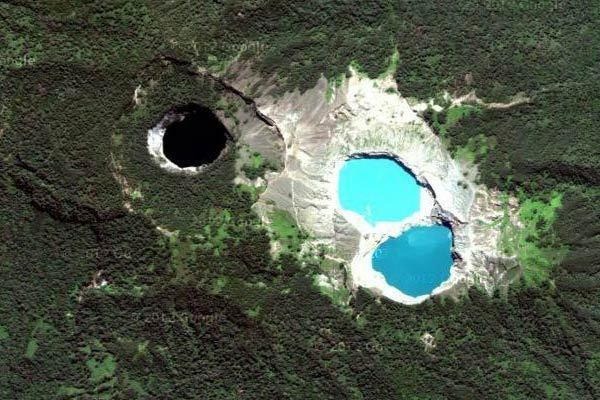 Kelimutu, however, manages to stand out with its three crater lakes, each a different color. Adding to its kaleidoscopic appeal, chemical reactions spurred by volcanic activity cause the lakes to change color. What color and when remains unpredictable. The lakes are each about a thousand feet in diameter and are found at the eastern summit of Kelimutu. Mt. Kelimutu is on the southern island of Flores. The volcano is a part of Mt. Kelimutu National Park, home to several endemic species.